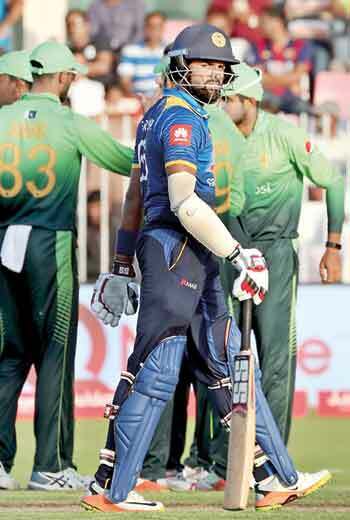 Sri Lanka will have to seriously reconsider their batting strategy to avoid a certain whitewash when they meet Pakistan for the fifth occasion in a One Day International (ODI) at Sharjah tomorrow. Despite winning the two-match Test series, the visiting Lankans depicted that they are a below par unit in the ODIs, having suffered four straight defeats in the five-match series against Pakistan. Failing to secure a win in the fifth and final game will mean that the struggling Lankans suffer their 12th successive ODI defeat and their third back-to-back ODI series whitewash. Besides the contribution Sri Lanka’s middle-order batsman, Lahiru Thirimanne, Pakistan recorded a comfortable 7-wicket win in the fourth game with 66 deliveries to spare on Friday at Sharjah. Sri Lanka failed to impress right across the ODI series, mainly due to their faltering batting lineup. The visitors were handsomely beaten by Pakistan who recorded a 7-wicket win in the third game at Abu Dhabi and they also won the second game by 32 runs. In the first game at Dubai, the Lankans were beaten by 83 runs, after losing the toss. In the following three matches Sri Lanka won the toss, earning the psychological advantage of consolidating their opponents, but on all three occasions it was proved otherwise. “We must take the responsibility on our batting. Right throughout the ongoing ODI series we have failed surpass the 35th over. This is a serious matter that all of us (including I), should take responsibility on,” admitting their woe, Lahiru Thirimanne, Sri Lanka’s top scorer of the fourth match, stated. Interestingly, in the ongoing ODI series between Sri Lanka and Pakistan, five players each of both teams are among the list of Top 10 batsmen. The list is led by Pakistan’s Babar Azam with 303 runs from four matches and Sri Lanka skipper follows with 191 runs ahead of Pakistan’s Shoaib Malik, who has accumulated 161 runs. Thirimanne is fourth in the list with 155 runs after his knock of 62 runs in four games. Next to him is Imam-ul-Haq, who has 102 runs in two outings, followed by his Pakistan team-mates Fakhar Khan and Mohammad Hafeez. The remaining three are Lankans Akila Dananjaya (70), Thisara Perera (66) and Niroshan Dickwella (62), all from four games. The list indicates how shallow the Lankan batting lineup is. “We need to take note on how to start the innings, how to consolidate and how to finish off. Out of the six batsmen we play with, the need is that only four guys should rise to the occasion and take responsibility. We have had discussion on how to go about things, how to rotate the strike and how to make shots that could reach the boundaries. Nothing has been working for us at the moment. We have a game left and we will need see how to face it and somehow win it,” Thirimanne added. “Throughout the series we have struggled to play Imad Wasim and Shadab Khan. We have had a chat on how to rotate the strike against them and how to hit boundaries but nothing seems to be clicking for us right now. In-between that, Hasan Ali comes in the middle overs and creates pressure,” he assessed while pointing out that the team is fine when it comes to talent. In 2017, Sri Lanka were whitewashed in South Africa and against India in a home series prior to facing a certain repeat against Pakistan. If the visitors fail to revert the repeating outcome of defeats, it will be their third successive whitewash of the current year. This year Sri Lanka also lost an ODI series against Zimbabwe and tied a three-match series against Bangladesh, both on home soil.